Quinsee opened up Duel 1 with Dark Grepher, Junk Forward, D.D.R. – Different Dimension Reincarnation, and 2 copies of Droll & Lock Bird. He Special Summoned Junk Forward from his hand and then Normal Summoned Dark Grepher. He combined his 2 monsters to Link Summon Isolde, Two Tales of the Noble Knights and used its effect to add Vision HERO Vyon to his hand. Then he used its effect to send 4 Equip Spell Cards including Divine Sword – Phoenix Blade to his Graveyard to Special Summon Armageddon Knight. He used its effect to send a Malicious to his Graveyard and then banished the Malicious to Special Summon a Malicious from his Deck. He combined Malicious with Isolde to Link Summon Summon Sorceress and then used Sorceress’s effect to Special Summon The Phantom Knights of Silent Boots. He then banished 2 Warriors from his Graveyard to return Divine Sword to his hand and banished another Malicious from his Graveyard to Special Summon one from his Deck. He combined Sorceress with Armageddon Knight and Malicious to Link Summon The Phantom Knights of Rusty Bardiche and used its effect to Set The Phantom Knights of Shade Brigandine from his Deck and send The Phantom Knights of Ancient Cloak to his Graveyard. Next, he used D.D.R. to Special Summon a Dark Grepher. He discarded Vision HERO Vyon to send Destrudo the Lost Dragon’s Frisson to his Graveyard and then Special Summoned Destrudo. 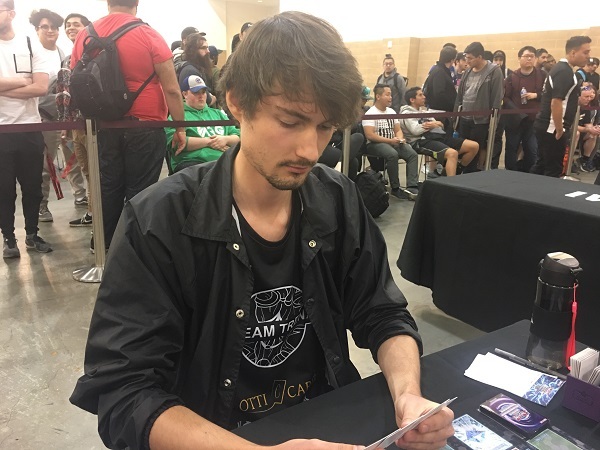 After a few more plays, Quinsee had Xyz Summoned Number 86: Heroic Champion – Rhongomyniad with 6 Xyz Materials behind it, prompting Koester to instantly concede. Quinsee takes a victory in under 4 minutes in Duel 1! Koester started off Duel 2 by Special Summoning Junk Forward from his hand and using Instant Fusion to Special Summon Invoked Raidjin. Quinsee then discarded Ghost Reaper & Winter Cherries and revealed Isolde from his Extra Deck to banish Isolde from Koester’s Extra Deck. Next, Koester revealed Nessie from his hand to use its effect, and randomly discarded Destrudo. He Special Summoned Nessie to the field and drew a card with Nessie’s effect. Then, he activated Foolish Burial to send Destiny HERO – Malicious from his Deck to his Graveyard and banished Malicious from his Graveyard to Special Summon another copy from his Deck. He then combined Junk Forward with Malicious and Raidjin to Link Summon Summon Sorceress and banished Malicious from his Graveyard to Special Summon another copy from his Deck Linked to the Sorceress. He then used the Sorceress’s effect to Special Summon The Phantom Knights of Ragged Gloves from his Deck. 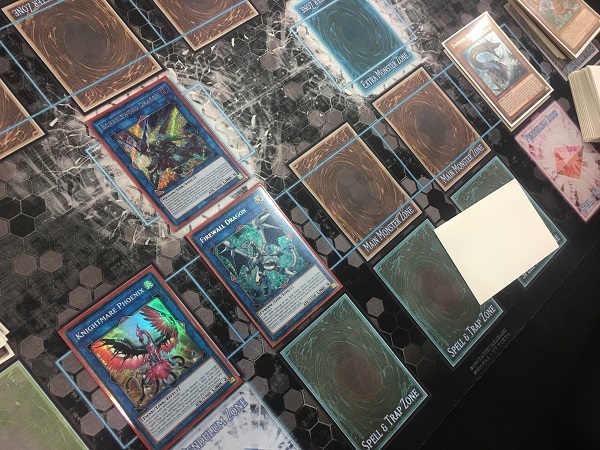 He then combined Malicious with Nessie and Sorceress to Link Summon The Phantom Knights of Rusty Bardiche and used its effect to Set The Phantom Knights’ Fog Blade from his Deck and send Silent Boots from his Deck to his Graveyard. He banished Silent Boots from his Graveyard to add Phantom Knights’ Fog Blade from his Deck to his hand. Quinsee had Danger! Nessie!, The Phantom Knights of Shade Brigandine, Dark Grepher, and Destiny HERO – Malicious in his hand. He drew Destrudo for his turn and then Special Summoned Grepher by discarding Nessie. He used Nessie’s effect to add Danger!? Tsuchinoko? from his Deck to his hand and then discarded Malicious to activate Grepher’s effect and send The Phantom Knights of Ancient Cloak from his Deck to his Graveyard. He banished Malicious from his Graveyard to Special Summon one from his Deck and then combined Malicious with Grepher to Link Summon Isolde. He tried to use its effect, but lost out when Koester flipped one of his Fog Blades. Next, Quinsee banished another Malicious from his Graveyard to Special Summon another Malicious from his Deck. He activated Isolde’s effect by sending 4 Equip Spells from his Deck to his Graveyard including a Divine Sword, even though Isolde’s effect was negated by Fog Blade. Next, he Set Shade Brigandine and activated the effect of his Tsuchinoko by revealing it. He randomly discarded it from his hand, using its effect to Special Summon it, and then banished Ancient Cloak from his Graveyard to add Silent Boots from his Deck to his hand. Quinsee sent Isolde and Malicious to the Graveyard to Link Summon Summon Sorceress next, and then banished 2 Warriors from his Graveyard to return the Phoenix Blade to his hand. He Set and flipped Shade Brigandine to Special Summon it, and then Special Summoned Silent Boots from his hand. Next, he activated Summon Sorceress’s effect, and lost out to another Fog Blade. 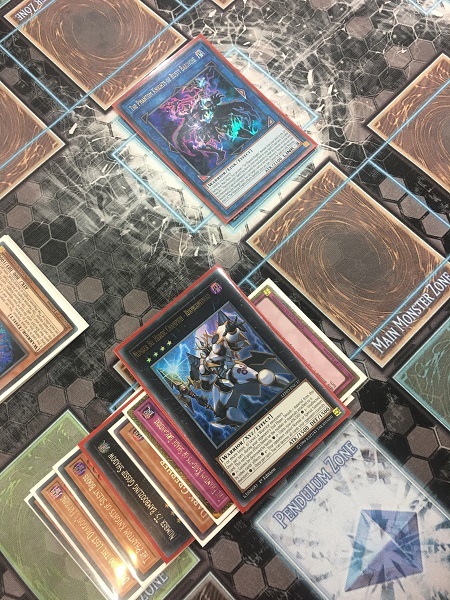 Quinsee sent 2 monsters to his Graveyard to Link Summon Knightmare Cerberus and then activated its effect by discarding a Divine Sword, destroying Ragged Gloves. He Special Summoned Destrudo from his hand next, and Tuned it with Tsuchinoko to Synchro Summon Yazi, Evil of the Yang Zing. He used Yazi’s effect to destroy Yazi and Rusty Bardiche and used Yazi’s effect to Special Summon Mare Mare from his Deck. After a flurry of plays, he had Link Summoned Firewall Dragon and had a field full of monsters! He attacked with Nessie, and Koester banished Fog Blade from his Graveyard to Special Summon Rusty Bardiche back to his field. Quinsee then used his Borrelsword’s effect to switch Nessie into Defense Position, allowing Borrelsword to attack twice. 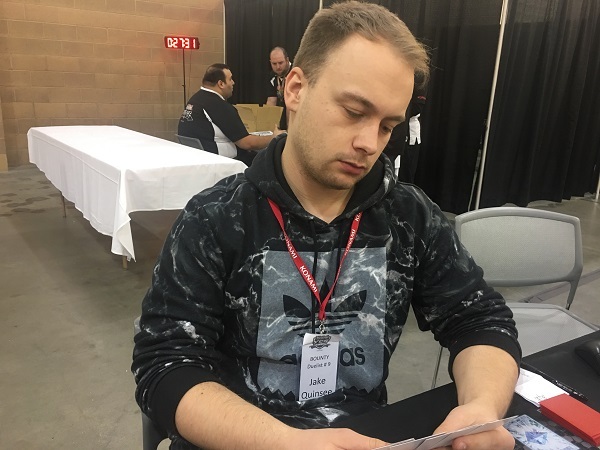 Two attacks from Borrelsword and an attack from Firewall and Knightmare Phoenix wiped out the rest of Koester’s Life Points and knocked him out of the tournament! Jake Quinsee is moving on to the Top 16!